I’ve been eying this fabric for months and I kept telling myself, I need to look for something else but every time I see this roll of emerald green perfection, I just can’t stop starring. Finally, when I came back to the fabric store, the roll was down to only a few yards. Of course, you always find yourself “wanting” something more than ever when it’s nearly gone, right? Purchased the very last piece of fabric and made it into this. It’s just a basic full length but it’s so elegant and feminine. What I love is the color and the simple silhouette which goes with practically anything. Your photos are absolutely breathtaking (and your outfit is gorgeous of course). Please share how you take such lovely photos! Love your complete outfit darling the green is so beautiful. You’re always on point! Know what I love most about this outfit? Like EVERYTHING! Looking so happy and beautiful. Love the vibrant green with those stripes. She just hangs on you so perfectly, looks so lush. 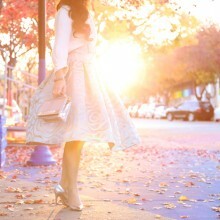 That skirt is enchanting! Gorgeous color, and love your choice of printed accessories. Super elegant outfit! 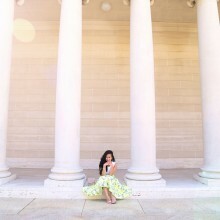 I love the gold accessories paired with the green skirt! LOVE your skirt. The color is so beautiful. I’m with you I love full midi skirts. Gorgeous outfit! That skirt color is SO pretty!